Sparks have always been a project of limited appeal. Their first record, released in 1968 under the name Halfnelson and (bizarrely) produced by Todd Rundgren, is a deeply odd piece of music that sold very poorly and demonstrated the Mael brothers' willingness to move in strange spaces and make music that would resonate with the small group of people who were willing to meet them on their own terms. They have, against all odds, cobbled together a career that spans five decades and encompasses 22 studio albums, and their set at This Ain't Hollywood was something of a victory lap, a retrospective of a brilliant career that even the men behind it could scarcely believe came to pass. On the last Canadian date of their The Revenge of Two Hands, One Mouth tour, the brothers turned in a performance that was strictly for the dedicated fans. Performing as a duo, relying on nothing but Ron's keyboard work and Russell's still remarkable voice, they played a set of deep cuts that showcased the depth of their songcraft and the indefatigable nature of their nerdiness. The crowd was made up of a combination of the people who had seen them on their last run through Hamilton in 1976 (a date the band admitted not remembering) and 20-somethings who had seen them in Toronto the night before. The crowd displayed complete devotion throughout, responding with nearly indistinguishable enthusiasm to the 1974 no. 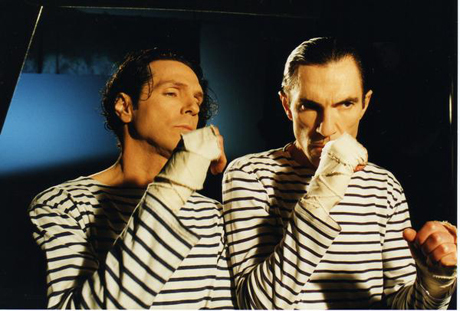 2 UK single "This Town Ain't Big Enough For The Both of Us," lesser-known tracks like "Suburban Homeboy" from their 2002 album Lil' Beethoven, and the never-released Ron Mael composition "Katharine Hepburn." The brothers took a moment to get comfortable, with Russell failing to display his range for the first couple of songs and Ron taking a rare turn on the microphone to angrily insist that if a certain member of the audience wouldn't put his phone away the sexagenarians would be returning to Hamilton to "deliver him a beat down." The duo found their place with "BC," from their 1974 album Propaganda and then never missed a step. There was something quite special about seeing Sparks — stripped down to their bare essentials, the Mael brothers — playing almost 50 years' worth of the songs they've written together to an audience that wanted nothing more than for them to keep playing. This was definitely a group preaching to their choir, but it's a choir that was hard-won and always unlikely. There will always be something wonderful about a room full of people united only by their love of something as utterly unique as Sparks.